Medical and forensic television shows – such as Grey’s Anatomy, House and the CSI franchise – have popularized how diverse fields of research, including DNA profiling, differential diagnosis and forensic anthropology, enable investigators to solve crimes and identify diseases. And, over the decades, inventors of the mobile phone, tablet computer, and even spacecraft propulsion systems have credited science fiction, like Star Trek, as the source of their ideas; this genre now is commonplace in entertainment media offerings. Still, most Americans believe that science-related TV shows and movies focus more on entertainment than getting the facts right – an assessment that they apply to both science fiction and more “realistic” genres. And, although these programs and films frequently employ poetic license in their portrayal of science, viewers credit them with creating a favorable image of how science, technology and medicine work. 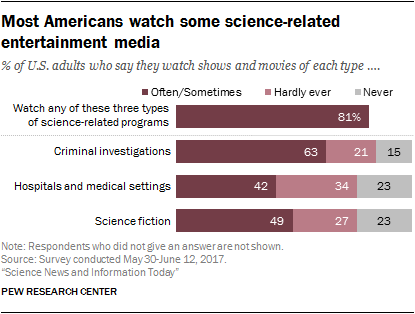 The vast majority of Americans watch science-related entertainment media. About eight-in-ten (81%) U.S. adults say they at least sometimes watch one or more of three types of shows and movies: criminal investigations, hospitals and medical settings, or science fiction. About two-in-ten (18%) say they hardly ever or never watch these three categories of entertainment. People who watch these types of shows and movies at least sometimes encompass all demographic, educational and political groups. For example, a roughly equal share of men and women, as well as highly educated and less educated adults view at least one of these genres fairly regularly (i.e., “often” or “sometimes”). Further, 78% of uninterested science news consumers report viewing one or more of these types of programs at least sometimes, as do 82% of casual and 90% of active science news consumers. This study finds viewers of science-related entertainment believe that these films and shows provide, on the whole, a positive impression of working in science, technology and medicine. A majority of Americans (56%) who fairly regularly watch shows about criminal investigations say these programs give a positive impression of working in science, technology and medicine; by contrast just 9% say the shows and movies create a negative impression. A similar pattern occurs among viewers of shows focused on hospitals and medical settings. About half (51%) of those who watch such shows at least sometimes say they provide a positive image of working in science, technology and medicine; just 12% say they create a negative image. And, while science fiction sometimes presents a dystopian view of the future, 44% of Americans who fairly regularly watch such shows and movies say the genre offers a favorable impression of the future of science, technology and medicine. Only 15% of this group says science fiction creates an unfavorable impression, and four-in-ten say the overall impression is neutral. When it comes to realistically portraying science, majorities of Americans say that each of these types of science-related entertainment tend to focus more on entertainment than on getting the facts right. For example, when it comes to science fiction, 79% say such shows focus more on entertainment, while only 18% say that these programs portray science, technology and medicine in a realistic way. While such views might be expected with regards to science fiction – a genre that purposefully veers from reality – the public holds similar perceptions of crime and medical shows. By a margin of roughly two-to-one, Americans think medical-oriented shows and movies prioritize entertainment (66%) over accuracy (32%). 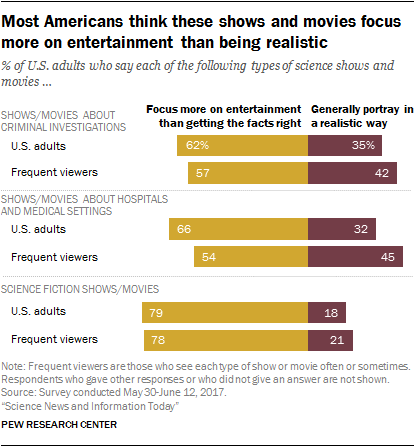 Similarly, Americans say crime shows focus more on entertainment than portraying science, technology and medicine in a realistic way by a margin of 62% to 35%. A central question surrounding science-related entertainment is whether the tendency of this genre to take poetic license undermines public understanding of science. From the public’s perspective, the answer appears to be no. 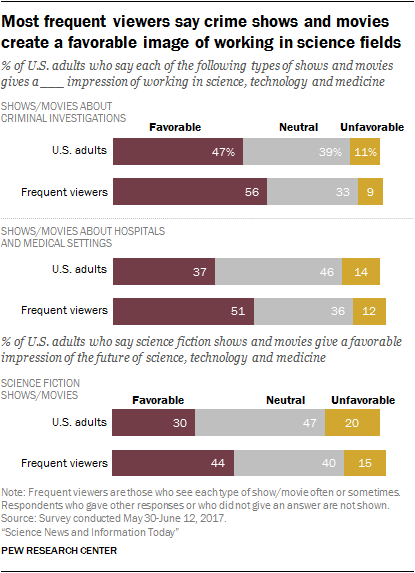 Most Americans say that both crime and medical shows and movies have no particular effect on their understanding of science, technology and medicine; those who do are much more likely to consider the effect positive than negative. About half of frequent viewers of crime-focused shows (51%) say these programs have no effect on their own understanding of science, technology and medicine. More say these shows help than hurt their understanding by a margin of 40% to 9%. Frequent viewers of medicine-oriented programs judge the effect of these shows on their own understanding in a similar way. 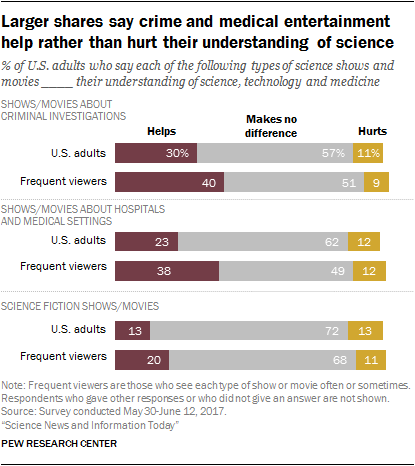 About half of this group (49%) says these shows and movies make no difference to their own understanding of science, technology and medicine, 38% say these shows help and just 12% say these shows hurt their understanding. When it comes to science fiction, nearly seven-in-ten (68%) of frequent viewers say these shows and movies make no difference to their understanding of science, technology and medicine.